Who would have thought that Busy Lizzie downy mildew would be one of the best things that happened to our gardens! Since it struck, about a decade ago, not only have gardeners had to find replacements for the plants that were covering our front gardens almost as quickly as bark mulch and concrete, plant breeders have diversified their efforts too and begonias have received a lot of attention. Begonias, as a genus, have so much to offer and, at last, some of their potential is being realised. When I saw that this new begonia from Woolmans was bred by Cambridgeshire-based Kerley & Co I knew it had to be worth a mention. David Kerley has received much praise in these posts in the past, largely for his Tumbelina petunias. Colourful, fragrant begonias are not entirely new – there have been large-flowered, tuberous kinds for at least a decade. But this is something new, a trailing, multiflowered plant with moderate-sized blooms in a delicious coral pink. But the real charm though is the rose scent. 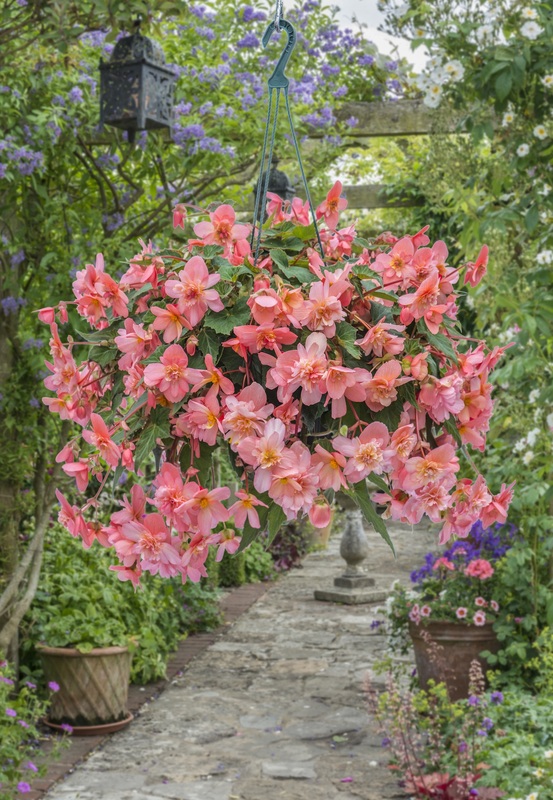 “Sweet Coral Cascade is really free-flowering, but for me its extra-special quality is the strong, rich, rose-like fragrance”, says Laura Oakes of Woolmans. “It also has lovely, glossy foliage to set off the flowers, which are disease-resistant and tolerant of poor weather, so it is a great all-rounder and blooms from June right through to autumn frosts. We are proud to offer this exclusively to UK gardeners in 2016. A pack of five jumbo plugs of Begonia Sweet Coral Cascade is priced at £12.95 (plus postage and packing) for despatch in April 2016. When flowering finishes in autumn, the tubers may be saved and stored dry and frost-free before starting them into growth again the following spring. To request a copy of the Woolmans Chrysanthemum and Ornamental Plant Catalogue 2016, go online at http://www.woolmans.com , telephone 0845 658 9137 or write to Woolmans, Western Avenue, Matrix Park, Chorley PR7 7NB. These sound really lovely..I have a place by my north facing front door. Do you think these will survive there? and how many plants for a 30cm hanging basket? Sorry for the delay in replying – I have been away! I think they will do well in your spot. I don’t like 30cm baskets because they dry out so quickly so just one per 30cm basket I think – but I would prefer three in a 60cm basket.